Okay whilst out shopping yesterday Garry wanted to make a seafood laksa for dinner (we used white fish fillets and prawns). 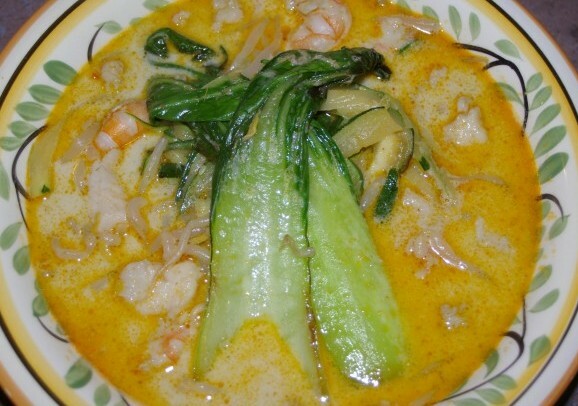 Having never made one before he bought the paste and pretty much followed their suggestions with the addition of Baby Bok Choy so lets call this a basic Laksa and we can fiddle with it from there. I have never had a laksa before and I enjoyed it very much so last night I looked around in google for different recipes and there seems to be quite a few variations to add to this so I will experiment with this sometime soon. But off the top of my head some variations that I saw were lime wedges, coriander, Vietnamese mint leaves, peanuts (I was thinking toasted flaked almonds would be good! ), tofu (bleh), fish sauce, extra chilli, cucumber, fried shallots plus additional curry spices. Now this is extremely simple to make and the only thing needing decarbing was the noodles. Now granted I have not had a real laksa so can't compare but zuchinni noodles were fantastic in this! Cut zucchinis into noodle like strips, chuck in small fry pan and saute in butter/oil until soft, transfer to bowls. Heat butter/oil in large saucepan, chuck in seafood and saute then add laksa paste and saute until fragrant, next add coconut cream, water and heat up. All you need here really is to cook the seafood so doesn't take long. In the same pan you cooked the zucchini in, saute the bok choy and bean sprouts and prepare the noodles. Next add noodles to bowls, then pour over the laksa and then add the sprouts and bok choy and that's it. YUMMO! Will be trying this one this week. I am making a fish pie tonight, I will post it, if it turns out. Ross and I both love love LOVE laksa and i didnt even think of it as being an option when we began BT. omg and zucchini noodles??!! We were both pleasently surprised,will be using them as noodles a lot, thanks !!! Same here - haven't had Laksa since going low carb. You've convinced me though and I 'll be getting the ingredients tomorrow. Just a thought - what about those new Changs low-cal noodles? Yep gonna try it and I'll let you know. I've had them with lots of other dishes but they are actually crying out for Laksa. Hmmm I might have to make this again soon, perfect weather for it! Hi Sherrie I have never had a laksa before so I don't know how spicey this is - spices do not bother me but Dh sweats at the thought of a mild curried egg sandwich - I'd like to try this - what do you think re the spices for Dh?